Soybeans will usually be grown in a rotation with other suitable crops in your farming area whether under irrigation or dry land production system. This article will examine some of the factors to keep in mind when implementing a moisture conservation programme in dry land soybean production. Before we look at protection of the surface of the soil it is important to understand something of the soil’s physical properties. Soil texture and structure greatly influence water infiltration, permeability and water-holding capacity. Soil texture refers to the composition of soil and the proportion of small, medium and large particles of clay, silt and sand. Soil structure encompasses the arrangement of the above noted soil particles into stable units called aggregates which give soil its structure. Aggregates can be loose and friable or they can form distinct uniform patterns. Your tillage methods, crop rotations and management practices will largely determine whether or not you are building aggregates or breaking down aggregates over the long term. Soil porosity is determined by the space between soil particles and consists of air and water. Soil at field capacity will have about 50% air and 50% water in the profile. This is the ideal state to aim for in irrigation or dry land production. Other factors that are important when examining and building your soils are water infiltration rates or movement of water from the soil surface into the soil profile and permeability which defines the ability of the soil to allow movement of air and water through the soil profile into the root zone so that the a balance can be achieved to stimulate maximum uptake of the plant of moisture and nutrients. How much moisture can be stored in the soil at field capacity? 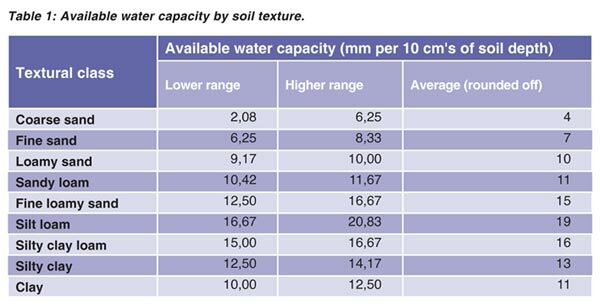 The main classes of soil are shown in Table 1 with the moisture holding capacity of each type in mm’s for every 10 cm of soil depth. Remember that each soil type, with enough depth to be economically viable, kept in production in dry land agriculture will have bands from top soil, subsoil and clay layers each with a different capacity to retain moisture. Ideal soils for dry land production will have a surface mulch good structure in the top soil, subsoil over a clay layer that when filled with moisture can help retain moisture in the whole soil profile. 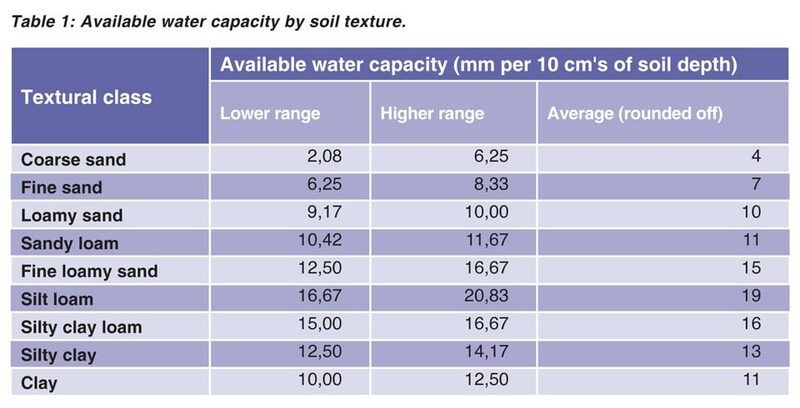 For example in a Westleigh soil with an effective soil depth of 120 cm with 90 cm topsoil and subsoil made up of a sandy loam over silty clay, the amount of moisture that can be stored would be 90 cm divided by 10 cm x the water holding capacity shown above which is 11 mm per 10 cm plus 13 mm per 10 cm x the balance of 30 cm making up the whole soil profile. The answer is that the whole soil profile can store 174 mm or 30% of the annual rainfall in an area where the annual rainfall averages 600 mm. If you could store this amount of moisture prior to the planting season it would put you in the most ideal position to be able to plant on time and for the germinated crop to be able to grow well for six weeks to two months before supplementary rain was required. Your cultivation system, whether or not being conventional or conservation tillage, should be implemented to enhance moisture conservation. Together with the crops grown in a rotational cycle the system should maximise keeping as much plant residue between crops on the soil surface to promote infiltration of rainfall and keeping the top and lower soil profile loose with the correct use of rippers or suitable type implements so that any rainfall will percolate into the whole profile. Effective control of weeds, to keep evapo-transpiration to a minimum, must be implemented either by mechanical or chemical control through the crop rotations. Keeping all the important soil factors in mind plan a cultivation system that will enhance soil moisture build up and preservation in order to give your dry land soybeans the best possible chance of surviving drought periods in the growing season.